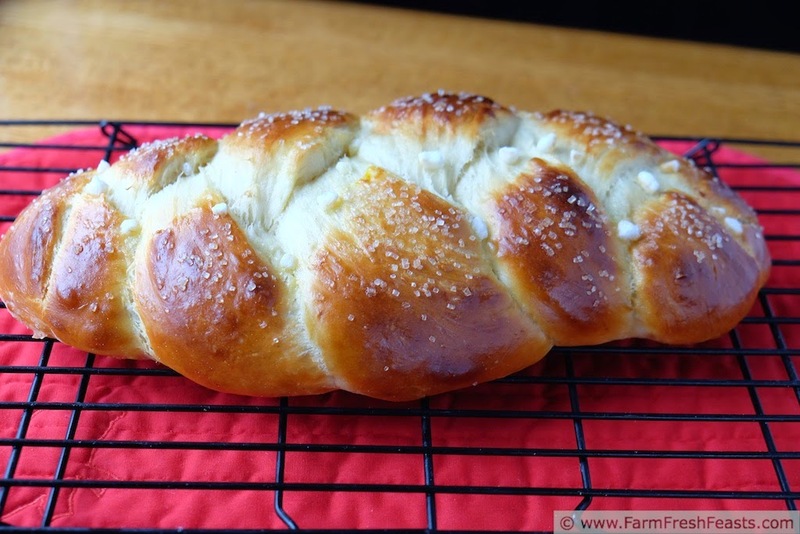 This is a recipe for Finnish Pulla, a cardamom-spiced lightly sweet braided bread. It is delicious plain or with butter, served alongside tea or coffee, or as an after school snack. The recipe makes three loaves which is terrific for gift giving during the holidays. Baking: art or science? Discuss. I think baking used to be considered an art, or perhaps more accurate, a series of crafts. Building a fire to the proper baking temperature is as much a learned skill as kneading dough or even beading bracelets. Nowadays I don't need to know much about building a baking fire--I use the keypad on the oven to type in the precise temperature I'd like, and double check it with my oven thermometer. I could re-learn the chemical equations which describe the reactions of a pile of ingredients turning into a loaf of bread, but I don't need to know how it works--just that it does. I braid one side towards the middle, then the other, then finish by pinching the end pieces together. My approach to this recipe is a mixture of science and art. Because my kitchen temperature averages 60 degrees Fahrenheit in the winter, I use my bread machine to mix the dough [don't worry if you don't have a freezing kitchen and a bread machine, I'll provide directions for mixing the dough]. When the machine is finished, though, my experienced eye takes over and shapes the dough until it looks right. The inspiring recipe came from Beatrice Ojakangas' book Fantastically Finnish. Instead of starting with whole cardamom pods I use the ground spice, and because I first had this while working on a dairy farm I like to use a richer milk. 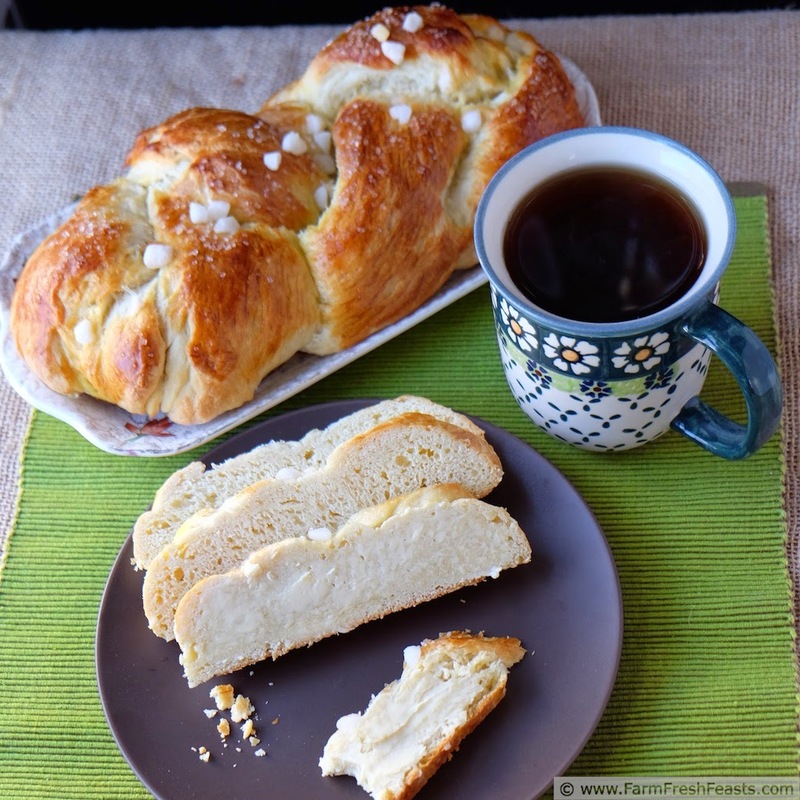 I have made this bread using all cream--very rich dough, very tender crumb, great way to use up 2 cups of heavy cream--as well as half & half and even 2% milk. Normally I'll say 'use what you have on hand' but if you've only got fat free milk please go grab a pint of half & half before making this. It is the holidays after all. Speaking of holidays, I'll be sharing sweet recipes each day during #ChristmasWeek. Tuesday I'll be sharing 3 lessons learned making Pecan Brownie Bites for a Cookie Drive, Wednesday it's back to Scandinavia for Fruit Soup, Thursday we're keeping things simple with Toffee Pecan Chocolate Chip Cookies, and Friday I finish getting my ethnic on with My Mother's Norwegian Lefse. If you're not into sweets, check out my Visual Recipe Index for more savory ideas for what to do with the produce from the Community Supported Agriculture (CSA) farm share, farmer's market, and garden. Note: this recipe calls for coarse or pearl sugar. I've been driving all around town looking for some more since my stash is running low. I found some Belgian Pearl Sugar at the grocery store down the street as well as some Coarse Granulated Sugar at a Christmas Tree Shops store. I put together a little photo to show the difference in sizes. I find the Belgian Pearl Sugar to be just a bit too big and crushed it with a can to get it smaller. Use milk, heavy cream or half & half. It's all good. If you've got a yeast-hostile ambient kitchen temperature and a bread machine, dump the first 8 ingredients into the pan in the order recommended by the manufacturer, select the dough cycle, and skip to #8. Otherwise, heat the milk gently (microwave on 50% power for a minute) in a microwave safe bowl, add the yeast, and stir until dissolved. Set aside. In a large mixing bowl, beat together 2 eggs and ¾ cup sugar until it is foamy, then add milk, cardamom, and 2 cups of flour. Beat for 2 minutes at medium speed until the dough is smooth and elastic. If you've got a dough hook for your mixer, switch to it now and mix in butter, salt, and the rest of the flour. Knead with dough hook in the bowl or turn onto a floured surface and knead until it forms a smooth ball, adding more flour if necessary, another 5 to 10 minutes. 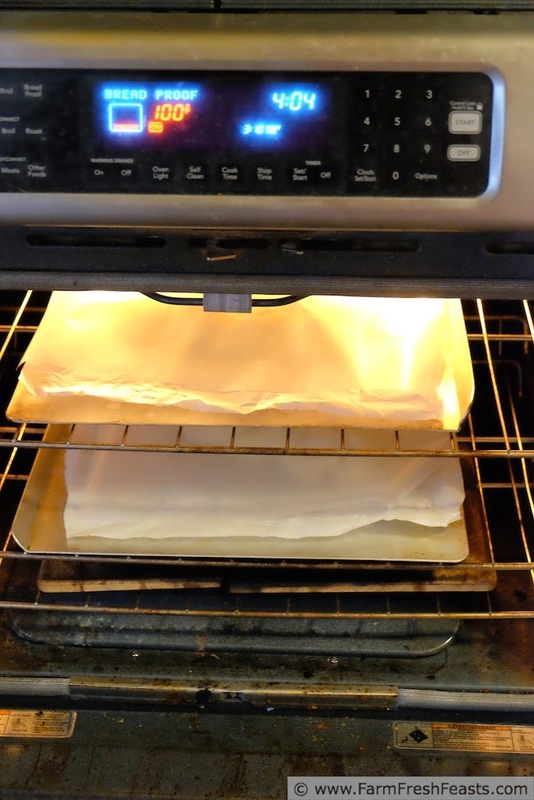 Transfer the dough to a buttered bowl and flip it to butter the top of the dough, then cover and let rise in a warm place until double [using a tall rectangular plastic storage container is great for this, because you can mark where the dough should rise]. Regardless of how you or your machines mix the dough, once the dough has had a first rise, turn it onto a floured board and divide into 3 equal parts. I use my kitchen scale for this. Take one third of the dough and divide it into thirds. Roll each third into a 12 inch long strip and place strips on a sheet of parchment paper or greased baking sheet. Braid the strips together, pinching the ends together and tucking under. 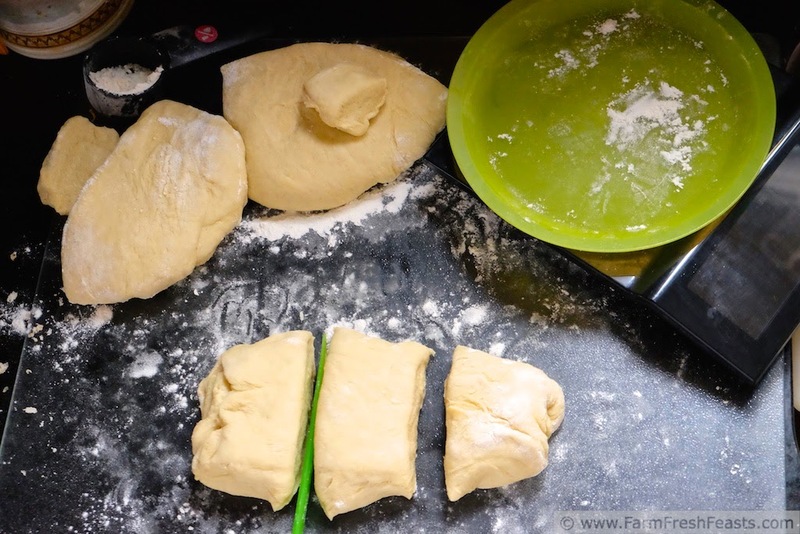 Repeat dividing and braiding for the other two portions of dough [dough can be refrigerated in a quart-sized bag for a few days]. Cover loosely and let rise for 30 minutes [I use the bread proof setting of my oven for this] or until you see it's puffier than it had been--but not doubled. Brush loaves with beaten egg [one large egg will cover 4-5 loaves] then sprinkle with coarse sugar. 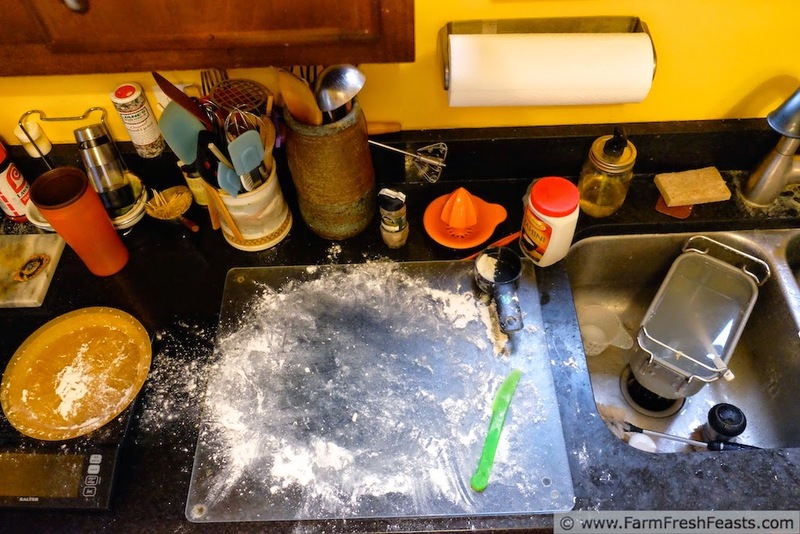 The scale, the flour covered board, the bread machine pan--tools of my trade. No tahini was used in the making of this bread though. Nor orange juice--that's from the Band Fruit Fundraiser oranges. I'm a visual learner so it really helps me when people *show* me how to do things more than just *tell* me. You crack me up, Kirsten. 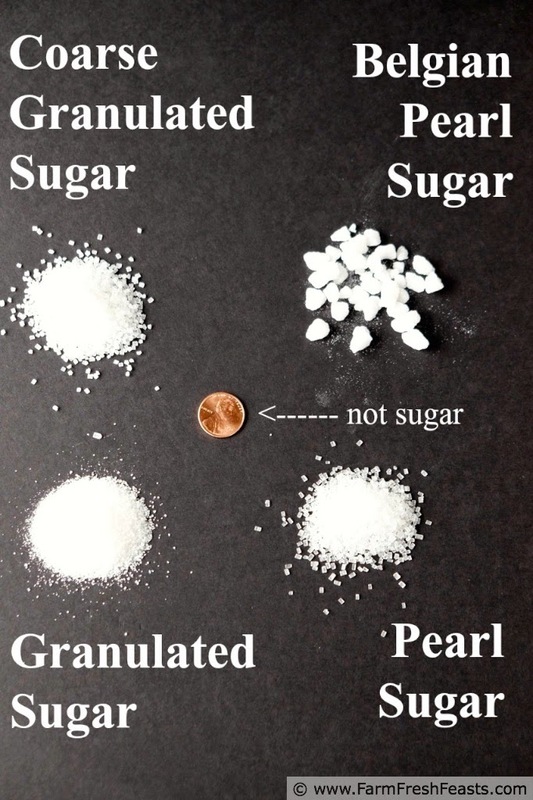 First the photo with the sugar and the penny that was not. Then your work space. I love that you shared both of those things with us. And that beautiful bread! Where to start? The lovely braid, the shiny crust, the tender crumb? I love it all! Just keepin' it real. I will never be a polished cook, and I'd rather let it be known that cooking creates mess. Then when the flour explodes all over you don't feel like a failure! I like making cut out cookies with my kids, it takes quite a bit of patience but they make it fun! Your kids are growing up with wonderful memories--well done! I'm kinda pleased with how the photos turned out--I supposed that if I kept making and photographing loaves, eventually I'd hit it decent. Aiii, pulla! I keep saying that we ate our weight in new potatoes and smoked salmon in Finland last summer ... but really, we ate our weight of pulla too! It helped that we found a little coffee shop we liked that had VERY good pulla (it’s not all good anymore, unfortunately) and so stopped there at least once a day for kahvi and pulla. You’ve put this on my “to make” list in the next few days! I say that I can eat my age in sushi, and over the past 20 yrs of saying that my appetite has not decreased ;) . I'm envious of your trip--always good to eat good food and make good memories! I love making my White Chocolate Cashew Coffee Biscotti. That sounds delicious! My son has recently become a coffee drinker, and I think I need to introduce him to the joy that is biscotti dunked in coffee (at least I hear it's a joy--I'm a tea drinker). This bread is absolutely stunning Kirsten. Stunning. Also: it's the science behind baking that keeps me from calling myself a real baker. Like you said, I don't need to know HOW it works, I just need to know that it does. But not knowing how it works means I am far from being able to develop many of my own baking recipes. PS. Happy #ChristmasWeek! Probably the best week ever. It's the most, wonderful time of the yeeeeeaaaaarrrrrrrrr!!! 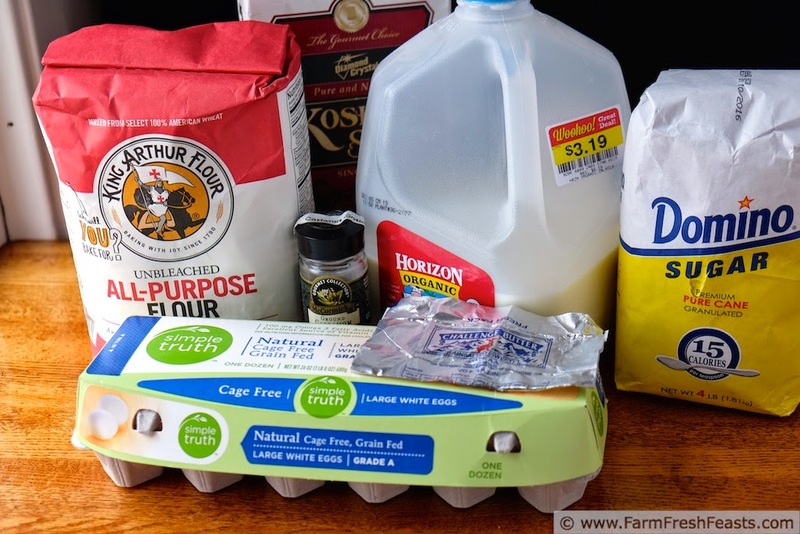 I'd love to have the set up to be able to make 3 different batches of ________ (insert name of baked good) each with differing amounts of _____ (insert name of baking component) just to test out which works best. Without having to deal with the resulting pile of food! 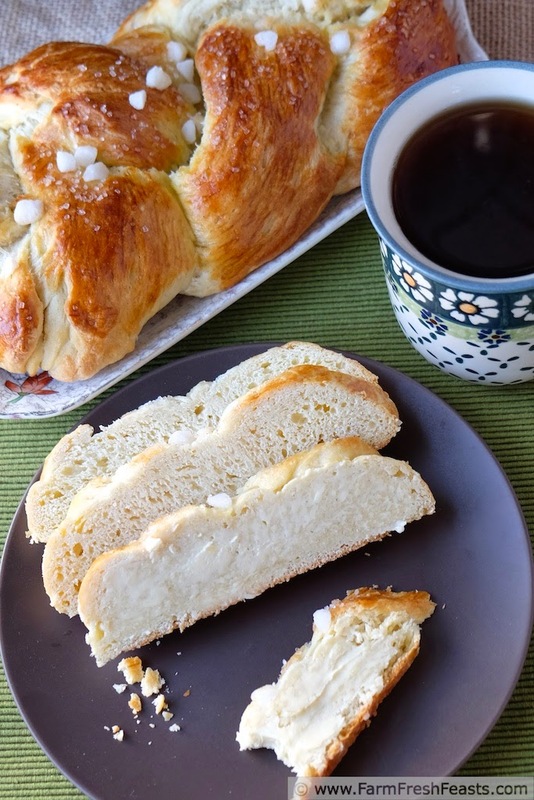 I'm so lucky to have a friend who makes pulla every year and gives me a loaf, which I stash in the freezer for just the right moment. It's a glorious loaf of bread. You ARE lucky! My neighbors benefitted from my massive pulla-making this season. Well, and the guy from the Foodbank who let me take home the right sugar! #ChristmasWeek is truly the BEST.WEEK.EVER! 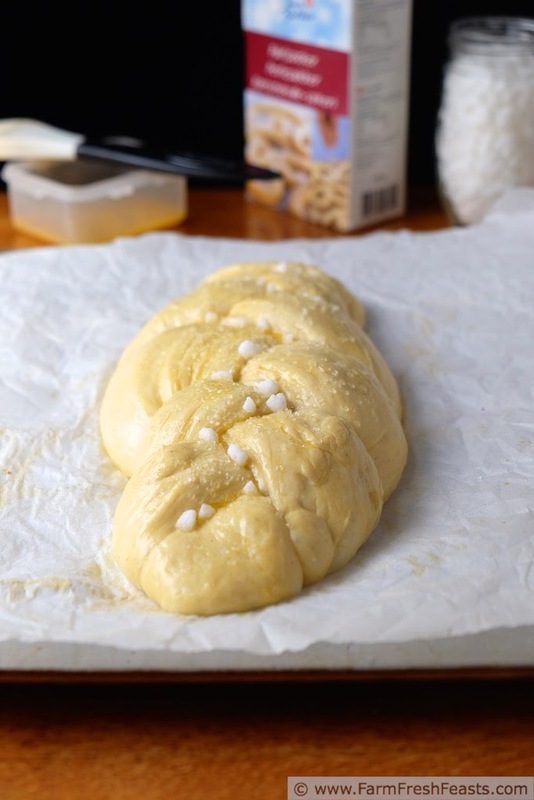 Your Finnish Pulla is just stunning. I love the science behind bread baking best of all. I don't bake nearly enough bread and I ought to change that. I like to bake in the winter when the kitchen is freezing--well, technically it never drops below 50 degrees in there but still. Close enough. To me, this bread looks like art. Gorgeous, and I love the meme. Also, I laughed out loud at the labeling of the penny. It is a goal in life to make you laugh out loud while reading one of my posts, because I am traditionally reduced to snorting giggles while reading yours. Totally gorgeous loaf of bread! Thanks for linking up with What's Cookin' Wednesday! Why thank you! I so often make brown food (I mean, how can you make pork neck and red lentil curry look appetizing? All the cilantro in the world won't help) so I'm happy when something else turns out.